Wouldn’t it be nice to live in a place of complete surrender, a place where you profoundly trust that you’re being taken care of by a Universal power? Where you trust that this Universal power is with you every moment? Where you live with the certainty that the Universe is really out to support you, that it’s on your side, that it’s got your back? We know that this can seem like a big stretch to believe. Sometimes, there’s a lot going on, and this can really feel like a BIG stretch. But, let’s lean into it just for a moment. We often try so hard to control everything in our lives that we forget the power of putting our faith in the Universe and just letting go. But once you get into the habit of doing all that you can from your humanness and trusting when you get that intuitive message that it’s time to let go and surrender to a Higher Power; and you actually do it, you’ll begin experiencing a deep sense of peace and wellbeing. Throughout history, the wisest men and women have known that their highest good came from trusting and letting go, from surrendering. We don’t mean the kind of surrender that is “losing a battle” kind of surrender, not the “white flag” kind of surrender, but the kind that is letting go of personal limitations and aligning totally with an intelligence and an energy that’s greater than ourselves. It’s the energy of Let Thy Will Be Done. It’s about saying “yes” to what the Universe brings you and being led by your soul throughout the day. It comes from a teaching in A Course In Miracles. What would Spirit have me do today? Where would Spirit have me go today? What would Spirit have me say, and to whom? Then, as you move through your day, listen to your inspiration from Spirit and say “yes” to whatever those answers are…trusting life’s unfolding. If you get stuck, ask the question again. 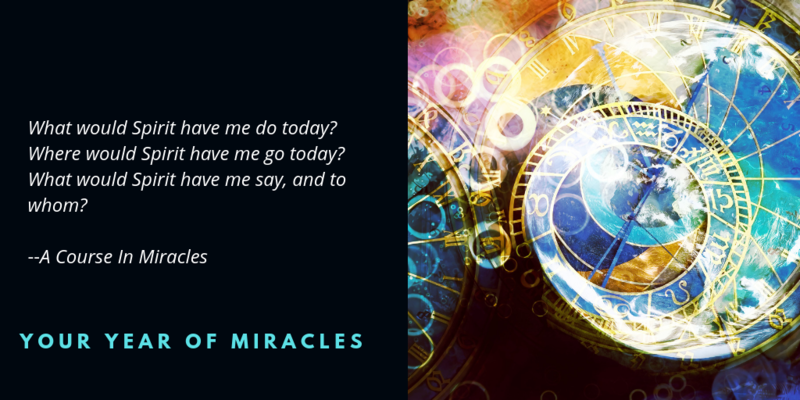 When you move through the day like this, when you trust that Spirit is guiding you and has your back, you’re going to find yourself living more and more in the Miracle Zone. Please share your experiences of trusting in the universe in the comments below. I am having some difficulty right now as I injured my knee about a month ago and am having a hard time walking, so am basically homebound. I have a deep belief in Spirit guiding me, but as far as asking where to go, I don’t have a lot of options. Also, i couldn’t work for a month, so am getting depressed about money, although my basic needs are provided for. Paula – I’m so sorry that you’re homebound. I’ll bet there are others who are also homebound and need a friend. Is there someone to whom you could reach out and support at this time? Someone you could bring joy to (even if it’s Facetime or some fun Snapchat pics)? Perhaps that would help lift you out of your depression and help someone else with theirs? Thank YOU, Jean. We love hearing from you. Trust can sometimes be very difficult, Paula. We’ve discovered this in our own lives too during times of unexpected change. (And we’ve both seen our fair share!) Sometimes it can be about learning to slow down or asking and receiving help or deepening self-love. I know what it’s like to be homebound, and no work all at the same time. When I was in that state, these three things got me out of my depression, and I was able to really see and feel, that every thing was going to be fine. 1. Every morning, I would sit up in bed and meditate for 45 mins…sometimes I would go for an hour. 2. Nature, has a way of melting away a worried mind. I am familiar with “A Course in Miracles”, as I’ve been on the metaphysical “path” for many years now. Life has become more challenging as I ‘elder’. (I refuse to claim I’m ‘aging! ), but whatever challenges I have been given, I say “YES!” to, and they thus become new exciting ‘pathways’ to tomorrow, when & where ‘anything IS possible! Joanne, YES! We’re in alignment with that! Im having money problems to many bills and not enough money to pay for them. I cant evan afford my meds. Keep focusing on what you want to bring into your life. We know this can be hard to do when all you can think about is what you don’t want. We know you’ve got this, Melissa! We see brighter times ahead for you. I have been battling of late to surrender to the higher power that I am aware controls the universe of which I have been taught guided and supported the believers in the past in Bible accounts. The more I trust and struggle to surrender the more peace and happiness I receive. The more I let go the more I am successful. Yes, Barrie! We so agree. Another one of our favorites books! Isn’t it wonderful how these resources are given to us? I am in that place of trust today. I am over-busy, sleep deprived, and at the same time, peaceful. Marci and Dr. Sue have put into words what I’m feeling today and what I hope to (and will actively pursue) feeling every day! Wow, what a masterful statement…”I am over-busy, sleep deprived, and at the same time, peaceful.” Hallelujah! I am going through an extended period of change and uncertainty right now – and there in my inbox with perfect timing comes your reminder to trust. Thank you for being there for me just when I needed it! Don’t you just love how it works??? Glad you were open to receiving the message that we’re here to deliver. Two days ago I turned down the offer of a project at my current workplace that I knew in my gut was ‘not right for me’. I was able to respond from my soul (I am quite sure) as I feel comfortable and slept well that night, although I have caused some concern at work. Your trust message came just at the right time because this is what I am now doing. I am trusting that having done the ‘right’ thing, things will work out for me and everyone else affected. This also means that I am achieving one of my miracle intentions of contentment – regardless of what is going on around me! Previously, I would have been agonising! Thank you both for a wonderful Miracle Moment! Wow, Margaret! That’s wonderful and we love how your Miracle Intention plays a part in this. Total Miracle Zone! Dr Sue N Marci thank you I am living my Miracle trusting the universe.Experience a beautiful sunset .The world is alive with life springing forth. From Winters potential. So wonderful to be in the moment and fully present. You’re so beautiful, Anne. Oh my soul.. I am sharing your wisdom with my team of real estate agents in Centurion, South Africa. Thank you, thank you..